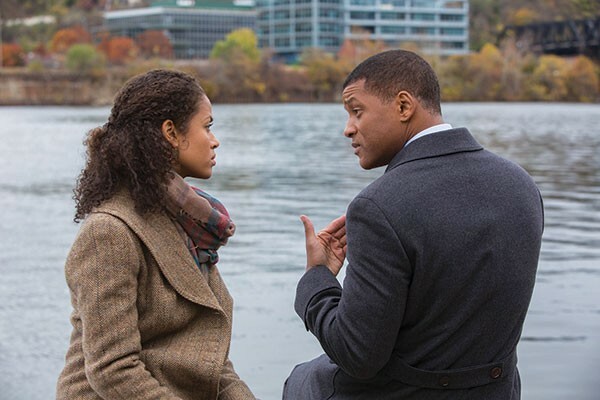 Peter Landesman’s docudrama Concussion recounts the discovery of a degenerative neurological condition linked to repeated concussions, such as those endured by professional football players. The disease, now known as chronic traumatic encephalopathy (CTE), was discovered in Pittsburgh, in 2002, by Nigerian-born Dr. Bennet Omalu (Will Smith) during a post-mortem exam of former Steelers center Mike Webster. Though Omalu convinces other medical professionals about CTE — including Allegheny County Coroner Cyril Wecht (Albert Brooks) — the NFL is less open to his findings, and even obstructive. The film is adapted from Jeanne Marie Laskas’ 2009 GQ article “Game Brain,” which like this work begins with the downward spiral of “Iron Mike” Webster (David Morse). The horror of these recreated scenes, combined with the real-life footage of “Jacked Up” clip reels where ESPN announcers cackle over brutal on-field player collisions, sets the stage. Concussion isn’t an advocacy film; it’s not pro football’s Blackfish. But this is the most high-profile outing CTE has had, and sports fans’ response to this issue is still being formed. Concussion is blunt in some ways, but leaves space for doubters and deniers — this was years ago, it’s just a couple of guys, the NFL is looking into it now, etc. And more than anything — and the film cops to this frequently — people don’t want to give up being football fans. Confronting the NFL knocked Omalu’s promising career off track, but he’s sanguine by film’s end: “I wish I had never met Mike Webster, but he gave me a great gift, a dangerous gift — the gift of knowing.” Now we know too, and Concussion ends with what may be its most effective message — Omalu watching two high school footballers charging head on into each other. People may still watch strangers play, but will they let their kids suit up?